Goodness knows what made me start to do this. Perhaps it’s the ‘public servant’ in me. Hey ho! Here’s a list of the Academic Health Science Networks (AHSNs), websites (click on the relevant AHSN name), their MDs, Chairs, and Twitter addresses. Some of this information can also be found on the NHS England website. In fact, through that you can also find a very interesting ‘matrix’ showing the priorities of each AHSN. 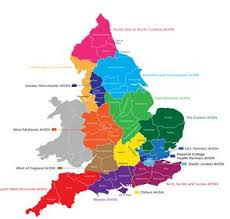 East of England and South London have listed public involvement as cross-cutting themes. I also know that some such as West of England have got a robust approach to it. But now you have the twitter addresses for each you know what I would do if I was you? I would drop my respective AHSN a twitter Xmas card asking them how that public involvement plan is going. After all, patients are for life not jus for Christmas. Glad to be of service and very happy to correct any mistakes.